The original home of the Welsh Mountain pony was in the hills and valleys of Wales. He was there before the Romans. His lot was not an easy one. Winters were severe. Vegetation was sparse. Shelter, most often, was an isolated valley or a clump of bare trees. Yet the Welsh pony managed not only to survive, but to flourish. Led by proud stallions, bands of mares and their foals roamed in a semi-wild state, climbing mountains, leaping ravines, running over rough terrain. This sort of existence insured perpetuation of the breed through only the most hardy of stock. Hence, the development of a pony with a remarkable soundness of body, a tremendous endurance, and a high degree of native intelligence. Even an edict of Henry VII that all horses under 15 hands be destroyed did not eliminate the Welsh. Hiding in desolate areas where his persecutors were reluctant or unable to go, perhaps at Nant Llwyd, he continued to live and reproduce, preserving for mankind a distinctive strain of pony that today has generated enthusiasm among breeders and pony lovers all over the world. Down through the years, the Welsh pony has served many masters. There is evidence to support the belief that he pulled chariots in vast sports arenas. He has worked in coal mines, on ranches, and on postmen's routes. The Welsh pony has adapted himself to the whims and needs of humans as easily as to his environment. He loves people. He responds well to proper treatment and discipline. He can be trusted. He is an ideal pony for a growing child, and he has the spirit and endurance to challenge an adult. Because of his heritage, the Welsh pony is not bothered by the somewhat extreme variations of climate and terrain encountered in the United States and Canada. That the Welsh pony carries a trace of Arabian blood seems beyond doubt. However, he has maintained his own dominant physical characteristics over the years. It has been demonstrated that the Welsh crosses well with many other breeds, and this is, to some breeders, an important aspect of his unusual versatility. One of the most noted Welsh breeders wrote: "The blood of the Welsh Mountain pony of perfect type can improve any other blood with which it is mixed. This is a very strong statement to make, but I have had ample opportunity to prove it." The purebred Welsh pony of today is an animal of great beauty and refinement. He has a proud. aristocratic bearing. Yet he has the substance, the stamina, and the soundness of body and wind which are characteristic of animals that long have lived close to nature. The purebred Welsh of today has a friendly personality and an even temper, intelligent and constantly alert. He has spirit, but this spirit is combined with gentleness and a willingness to obey. He does not resent discipline and shows respect for the master. young or old. who shows respect for him. For those unacquainted with the Welsh, the first sight of a small herd, perhaps grazing in a hollow near a stream, is something to be remembered... "They are startled at your approach. For one second they stand with heads erect, nostrils distended, ears pricked and tails held high. Then they are off, flying over the rocks and rough ground, sure-footed and beautiful, their manes and tails tossed in the wind. In selecting the one we want, we shall look for the great bold eye, the tiny head, short back, strong quarters, high set of tail, fine hair, hocks that do not turn in, the laid-back shoulder, the straight foreleg, and the short, so very short, cannon bone." One of the outstanding breeders of Welsh has said: "The bigger the eye, the better; the deeper through the heart, the stronger the prouder the lift of the head, the more courageous; the swifter the action, the more fearless." 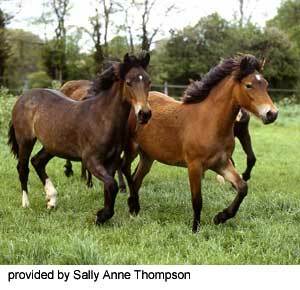 The pure Welsh pony may be any color: black, gray, bay, roan, cream, or chestnut. He can never be piebald or skewbald. Although essential points of conformation can be listed and should be considered, it is the combination of desirable physical characteristics, plus a pony's highly individual personality, plus one's own preference for color, which makes a pony exactly the right pony for any one person. One of the great thrills of breeding Welsh ponies is the chance or calculated mating of two animals, so compatible and complementary, that they produce a near-perfect specimen. This is the challenge. And the goal, with carefully chosen Welsh stock, is not unattainable. 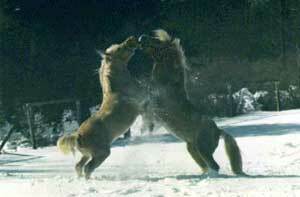 Welsh ponies were imported by American breeders as early as the 1889s. George E. Brown of Aurora, Illinois, appears to have been one of the first real Welsh enthusiasts, importing a large number of animals between 1884 and 1910. Principally through his efforts and those of John Alexander, The Welsh Pony & Cob (the word "Cob" was dropped in 1946) Society of America was formed and certification for the establishment of a breed registry was issued by the U.S. Department of Agriculture on July 30, 1907. By 1913 a total of 574 Welsh had been registered, and the owner-breeder list showed applications coming from Vermont, Ohio, Kentucky, Virginia, Texas, Oregon, Iowa, Massachusetts, New York City, and Canada. The popularity of the Welsh was spreading, and his great versatility was already becoming apparent, not only because he was adapting himself well to any geographical area, but because he was being put to many uses, both by children and adults. It was the concern of early importers and breeders that a "purity of the breed" be maintained, and this subject was regularly discussed with Welsh and English breeders who had established their own registry in 1901. Mr. Brown summarized his views in this way in a report to members of the American Society: "With a correct standard fixed and uniformly adhered to, nothing can block the advancement of Welsh to front rank in their classes." He called the Welsh "the grandest little horse yet produced". 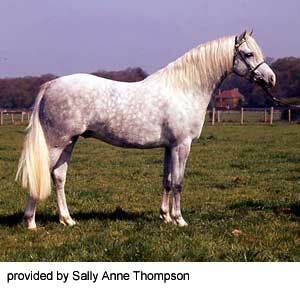 Today's Welsh pony is a quality animal of unusual versatility and wide use. To see him is to admire him and love him. To own him and enjoy his companionship is a privilege that certainly will be enjoyed by more and more people over the years ahead. No wonder in these days of rising costs and enforced economy the Welsh Cob (and his smaller counterpart, the Welsh Pony of Cob type) becomes more and more popular as he gets better known. He is an "all-rounder" - equally suitable for riding or driving. Moreover he is healthy, hardy and strong, living out all the year round. For the average horse-loving family he answers the longing for something easy to manage and keep. He meets the needs of young and old alike. He has the warm-blooded lovable pony nature - active, kind, intelligent and willing. He has no pampered background. Throughout the ages he has flourished and worked on the small Welsh farm sharing in the often poverty-stricken conditions that prevailed. This was the sort of life that has made him what he is. Evidence of the existence of the Welsh Cob in the middle ages and even earlier can be found in mediaeval Welsh literature. According to description he had to be "fleet of foot, a good jumper, a good swimmer and able to carry a substantial weight on his back". He had also to be capable of drawing loads of timber from the forests and doing the general work on the upland farms long before the introduction of heavier animals. Both in times of peace and war he has played his part. No doubt in 1485 the British throne was gained by Henry Tudor with the help of the Welsh Militia on their cobs which he gathered round him on his arrival from France at Milford Haven as he traveled up the west coast of Wales. And indeed much later the Morgan Horse almost certainly owed his origin to the Welsh cobs left behind by the British Army after the American War of Independence at the end of the 18th century. The founders of the Welsh Pony and Cob Society in 1901, in their wisdom, decided to register and record this ancient breed together with the Welsh Mountain Ponies and the larger Welsh Ponies in the Welsh Stud Book, dividing them into four sections according to height and type. Essentially the description for each section is similar - the typical short Welsh pony head with small ears, the large prominent eyes and open nostrils, the well-laid shoulder, short back and powerful muscular quarters With gay tall carriage - standing on good clean legs with dense bone on sound feet. The characteristic fast trotting action of the Welsh Cob and Pony of Cob Type like that of the Mountain Pony should be true, bold and free, covering the ground with forceful impulsion from the hocks. Before the advent of the motor car the Welsh Cob was the speediest mode of transport for the doctor or tradesman and others eager to get from here to there in the shortest time. Business men in South Wales were, known to select a cob by trotting him all the way from Cardiff to Dowlais - some 35 miles uphill all the way. The best would do this in under three hours never slackening or changing pace from start to finish. Before licensing was introduced in 1918 stallions and breeding stock were selected by this kind of test and by means of the old trotting matches which took place with a stopwatch over a measured distance on many roads in Wales. Such names as the many Comets, Flyers and Expresses which abound in the early volumes of the Stud Book testify to their speed and prowess. Nowadays the Welsh Cob has come back into his own after a long period of disregard and neglect. He has proved himself as the ideal trekking animal - safe, sure-footed and responsive - and for private driving he is unrivaled. A natural jumper, he is also, owing to his tractable and gentle disposition, perfect for the disabled rider. At shows Welsh Cob classes always draw the crowds who love to see these magnificent creatures shown in hand by experts, displaying their presence and courageous action. In harness, too, the Welsh Cob is spectacular and has recently proved in combined training events under F.E.I. rules that he can compete against all and beat, them. His innate suitability for high school and dressage in the "Lippizaner" manner is being now realized and demonstrated in Austria. Any color is allowed - except piebald or skewbald. Chestnut, bay, brown and black are most usual. Greys are rare, but there are a number of duns, palominos and creams. The Welsh Cob is beyond doubt the most versatile of animals in existence and long ago established a reputation as the best ride and drive animal in the world. Welsh Pony and Cob Society of America, P.O. Box 2977, Winchester, VA 22604. Phone: (540) 667-6195. John Thompson, Animal Photography, Marylebone Mews, London W1G 8PY.